By providing items to help furnish a young person’s first apartment, you can help a homeless youth leave homelessness behind for good. Youth Emerging Stronger is securing additional scattered-site apartments for additional Transitional Aged Youth (TAY) to be served through its Transitional Living Program (TLP). For homeless youth, this apartment is so much more than a “place to sleep”. It is an opportunity to develop a sense stability and safety while they continue to heal and develop future goals and life skills that pave the way to independent living for years to come. 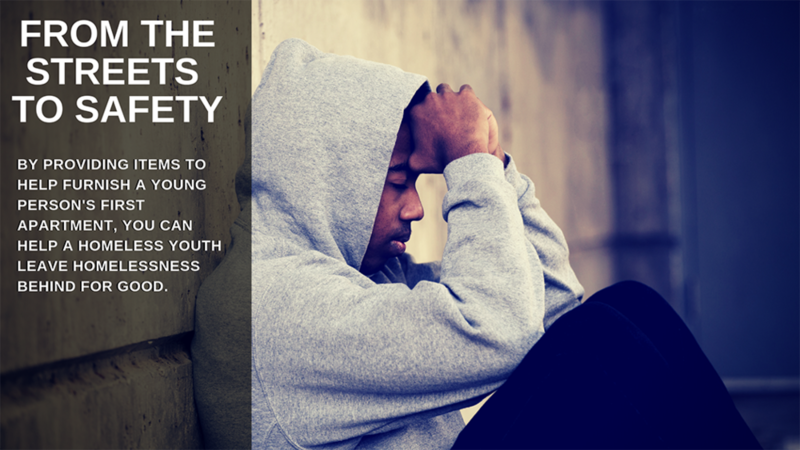 We need your help to make sure these youth have what they need! Help YES purchase all the essentials needed for a one-bedroom apartment. Help YES purchase items like a couch, coffee table, rug, side chairs, lamps, kitchen table, dinette set, microwave, toaster, cooking utensils and more. Help YES purchase items like a bed, mattress, nightstands, desk, dresser and more. Help YES purchase items like a shower curtain, shower caddy, bath mat, towels and more. Help YES purchase items like Cleaning Supplies, Laundry Supplies, Vacuum, Iron/Ironing Board, and more.